HARTFORD — All proposals for new laws in the State of Connecticut were due to legislative leaders on Friday, January 18th. 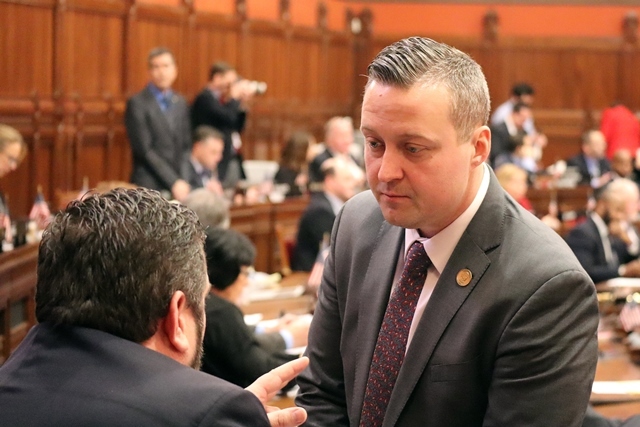 State Representative J.P. Sredzinski (R-112) submitted a few bills that would significantly benefit the towns of Monroe and Newtown. All bill proposals in the General Assembly are considered by legislative committees, and potentially brought to a public hearing, before being raised to the House and Senate for a vote. To read more about the bills that Rep. Sredzinski has proposed or co-sponsored this session, visit his website at www.repsredzinski.com and click on the “Legislation” tab. If you are interested in sharing your opinion on a bill, information on how to testify at a hearing or via email is available at www.cga.ct.gov. Rep. Sredzinski proposed House Bill (H.B.) 5154, which would promote mental health/wellness training and suicide prevention for police officers. This bill has been referred to the Public Safety and Security Committee, on which Rep. Sredzinski serves as the lead House Republican. Email testimony to pstestimony@cga.ct.gov. A second bill, H.B. 5373, would prohibit the governor from making rescissions to towns’ education cost-sharing grants during a fiscal year. This bill was referred to the Appropriations Committee. Email testimony to apptestimony@cga.ct.gov. Finally, H.B. 5377 would require local or regional boards of education to allow private therapists – under a written order by a medical professional – to provide medically necessary therapy or other care to students at school during regular school hours. It was referred to the Education Committee. Email testimony to edtestimony@cga.ct.gov.